I know a lot of the country is having some serious winter weather at the moment, but here in Colorado we’ve been experiencing record breaking heat. It’s been crazy! It was almost 75 degrees here yesterday–in February. That’s the thing about living in Colorado, it can be 70 degrees one day and snowing the next, especially as spring approaches. 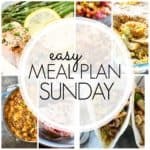 Which is why I love being prepared with dishes that are perfect for any season, and this week’s meal plan is loaded with dinner ideas that work all year-round. There’s plenty of lighter fare in this week’s plan, like Chicken and Orzo, or Sheet Pan Salmon. And don’t forget to check out our new healthier option. Those roasted chickpeas are probably all-time favorite healthy snack! If you’re still in the throes of winter, the Crock Pot Hearty Chili Mac is the perfect meal for warming up with. And no matter the season, dessert is always a good idea, and there are two delicious looking cheesecake desserts in this week’s meal plan that I can’t wait to try. No matter what the weather is like where you live, you’re sure to find some recipes that will be perfect for serving you family this week!